Saint Adrian also Hadrian of Nicomedia was a Herculian Guard of the Roman Emperor Galerius Maximian. 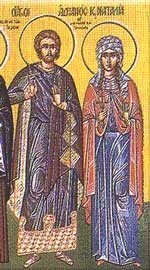 After converting to Christianity with his wife Natalia, Adrian and was martyred at Nicomedia on 04/03/306. While presiding over the torture of a band of Christians, he asked them what reward they expected to receive from God. They replied, "Eye hath not seen, nor ear heard, neither have entered into the heart of man, the things which God hath prepared for them that love him". He was so amazed at their courage that he publicly confessed his faith, though he had not himself yet been baptised. He was then imprisoned himself. He was forbidden visitors, but accounts state that his wife Natalia came to visit him dressed as a boy to ask for his prayers when he entered Heaven. Saint Hadrian is protector against the plague, and patron of old soldiers, arms dealers, butchers and communications phenomena. He was the chief military saint of Northern Europe for many ages, second only to St. George, and is much revered in Flanders, Germany and the north of France. He is usually represented armed, with an anvil in his hands or at his feet. Patronage plague, epilepsy, arms dealers, butchers, guards, soldiers. Finished Reading about Saint Adrian, Bring me Back to Catholic Saints please.